HOW TO NEGOTIATE SO EVERYONE WINS - ESPECIALLY YOU! In this revised and updated version of the renown classic, a true master shares his secrets and strategies for successful negotiation. Ron Shapiro is a negotiation expert, New York Times bestselling author, attorney, business leader and educator, and in what is almost a contradiction in terms, one of today’s most respected sports agents. 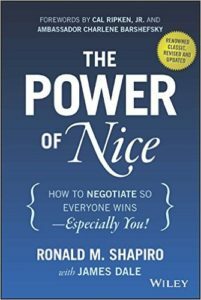 Whether you are negotiating with a customer, setting a curfew with a teenager, or getting the last seat on an over-sold airplane, this invaluable guide will help you embrace a systematic process to Negotiation known simply as “The Power of Nice.” You maximize your return, but you still give the other side a satisfactory result- you end up with an enhanced relationship. Through a combination of anecdotes, exercises, and time-tested approaches, you will learn to cultivate lasting relationships and immediately turn yourself into a better negotiator.